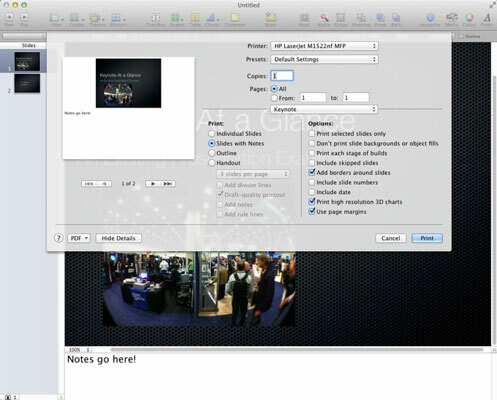 If you’re presenting a lengthy Keynote slideshow from your MacBook with plenty of information that you’d like to print so your audience will remember it, nothing beats handouts that include scaled-down images of your slides (and, optionally, your presenter’s notes). You’re not limited to just paper, though! You can also use Keynote to create an electronic PDF-format document instead of a printed handout, which your audience members can download from your website. Or, if you’re an educator with access to an interactive whiteboard (such as the SMARTBoard), you can use this new technology with Keynote. Click the desired format for printing your slides and notes. (Optional) Set specific options from the Options column. You can include elements such as the date, borders around each slide, and the slide number as part of each page of the hard copy.